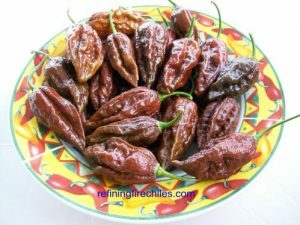 7 Pot Primo Chocolate-(Capsicum chinense)-This is also called the Chocolate Primo. It is the Brown or Chocolate colored variant of the 7 Pot Primo. 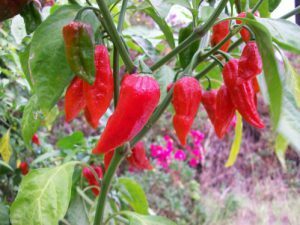 Back in 2005 a man named Troy Primeaux (Nickname Primo) a Horticulturist and member of the Southern Rock band called Santeria from Lousiana grew out some of the first seeds of the Naga Morich in the United States. These seeds were obtained from his friend Mark in the U.K. who got the seeds from a market in Bangladesh. So Primo grew them out true. 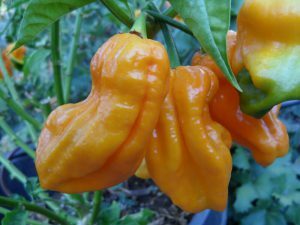 Shortly afterwards he obtained some Trinidad 7 Pot seeds from a professor friend of his who got the seeds from an elderly woman in Trinidad. 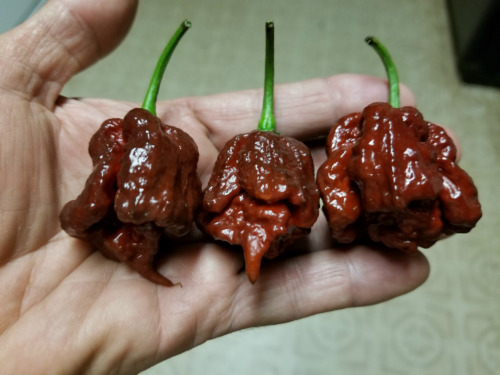 These two chiles made the original 7 Pot Primo. This Chocolate variant has more of a smokey flavor and some say is equal or higher in heat level. 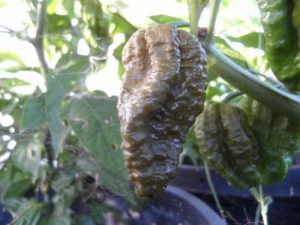 The 7 Pot Primo Chocolate chile plants grow over 4 feet tall.